Women have become one of the most prominent forces in wealth. Given the increasing number of career women who head corporations, run their own household, and invest, women’s influence over wealth today has become a significant factor that no longer can be overlooked. Women control primary decision making over investable assets in about two-thirds of households in some of the world’s largest economies, including the US and China, equating to more than $39 trillion globally. Women now represent one of the most powerful economic groups in the world, and collectively represent the second largest world economy based on earned income vs GDP. One of the trends driving the change is education level, suggesting continued growth in earning power. Women compose a greater share of college students than do men, and higher education levels tend to foster greater wealth creation. According to the National Center for Education Statistics, women currently hold the majority of college degrees at undergraduate and graduate levels. According to a report by Boston Consulting Group, of the women with a private net worth over $100,000, almost half were self-made; the report estimates that by 2020 women will control $72.1 trillion globally. 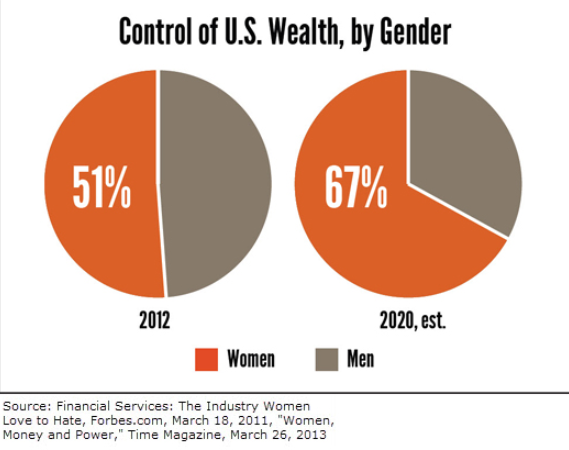 Women make up 51% of the U.S. population and they are on the verge of inheriting 70% of the wealth transfers over the next two generations. Reflecting on historical social and economic landscapes, gender differences between men and women are apparent. 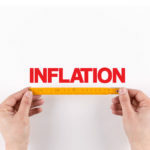 Gender gaps in employment, compensation, responsibility levels, confidence, and knowledge regarding financial decision-making led to a historical disparity in wealth creation in women. Now, as wealth among women continues to grow, so too does the significance of fostering meaningful change throughout many industries. It is vitally important for all industries to recognize the substantial impact of this shift in opportunity, and the implications of the role women will play in the future of business, tech, and innovation. The increase in women’s economic power and financial success has created new challenges across many industries—particularly in our own, wealth management. 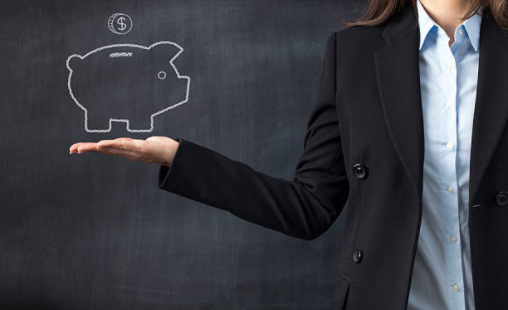 Traditionally, women who have or will accumulate a significant amount of wealth have been marginalized, and the sad but true reality is that women are often left underserved in the wealth management industry. The current business and investment landscape must acknowledge and cultivate the monumental change of women’s growing wealth. With the success of woman-owned companies like Spanx and S’well, we are witnessing a rise of woman-focused innovation. The shifting landscape in women’s wealth has forced industry participants to refocus and reorient business strategies. Women have emerged as involved, dedicated, and educated investors. The spending power of women and the amount of wealth they control has grown significantly and continues to do so. Women have become a meaningful investor segment—a massive opportunity for wealth management firms too great to pass up: in the United States, it is estimated that $5 trillion of wealth held by women is not managed by a financial advisor. 53% of women surveyed by the Center of Talent Innovation did not have a financial advisor, and 75% of women under 40 in the United States reported not having an advisor. However, to service this critical segment, firms need to develop a detailed and holistic approach to focus and meet the specific needs and interest of women investors. Education is also a critical service offering: women are interested in making informed decisions on what investments are being made and the reasoning behind them. In addition, research indicates women tend to be more interested in investing in companies to which they can attach meaning and purpose, and socially responsible investing strategies that incorporate environmental, social, and governance factors (environmental, social and governance [ESG] refers to the three central factors in measuring the sustainability and ethical impact of an investment in a company or business). Women characteristically view investments on a personal level and have a greater attachment to how and where they choose to invest their money. Any way you interpret the numbers, it is clear that women more than ever have emerged as an underserved demographic within the financial services industry. There is a transition of both wealth and wealth knowledge taking place right now. In order to truly serve this market we, as advisors, must be cognizant of how women invest and must be able to effectively communicate processes. This approach must be coupled with demonstrating value in a meaningful way that is different than historical practices. Women are only going to continue to grow as an influential and critical force in the wealth management industry, and only the firms that recognize this shift will have the tools necessary to support this movement.